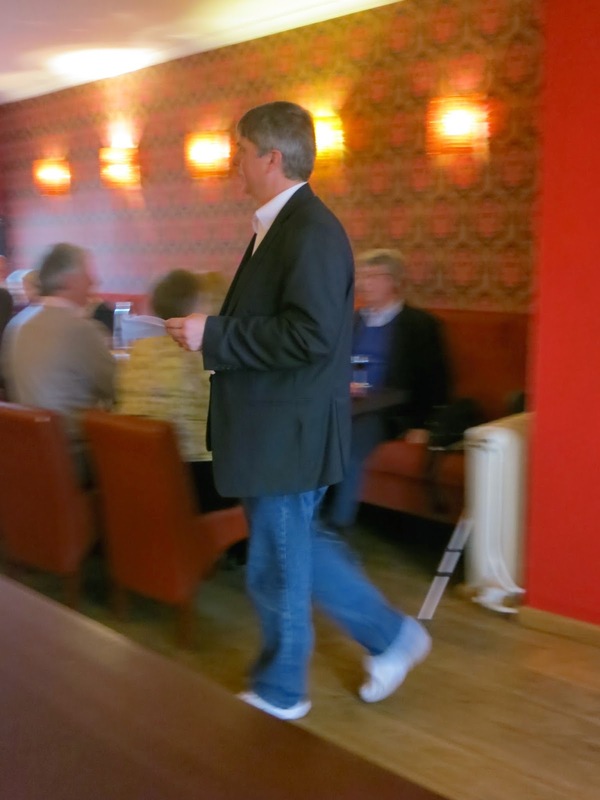 The Brussels Brontë Group’s annual Christmas lunch took place on Saturday 6 December, at the restaurant ‘Carpe Diem’. It was attended by 38 enthusiastic lovers of the Brontës and 19th century literature. As usual Jones Hayden was the Master of Ceremonies and he made sure that we were properly entertained. The entertainment was varied and interesting. Jones and Paul Gretton had produced a Quiz about the Brontës which was not that easy to get right (although we think we know almost everything about them!). 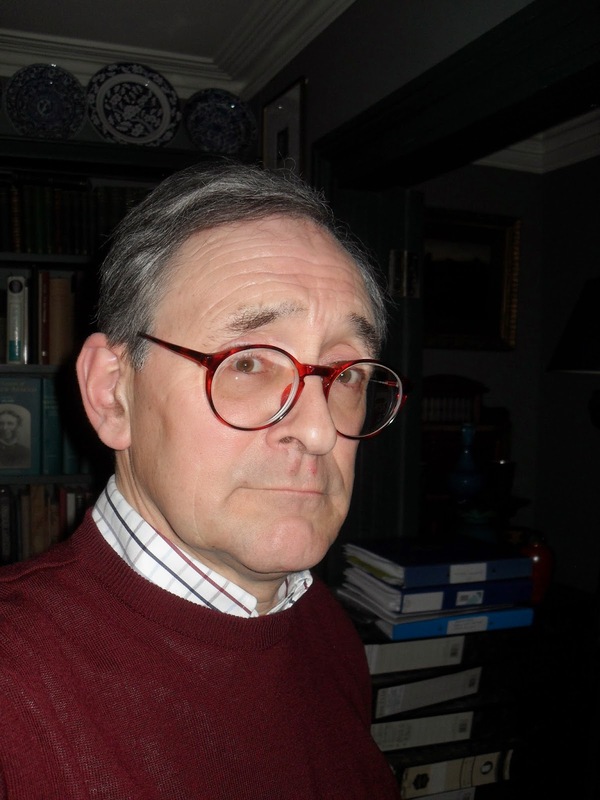 Graham Andrews read the poem ‘Transvestism in Brontë novels’ by Patricia Beer. Our actors’ team, that is, Daniel Mangano, Myriam Campinaire, Robyn Colwell, Kate Healy and Brian Holland performed ‘Christmas Dinner at the Parsonage’ which was first published in ‘Punch’ magazine in 1935. They all gave engaging portraits of (in order of actors) Mr Bronte, Charlotte, Emily, Anne and Branwell. The Brontë sisters are widely popular all over the world. Probably more popular today than they have ever been. I think that each one of us, who is a fan of the sisters and their books, have our own idea how they were and how they lived. A lot of biographies have been written about their peculiar story and lives, first of them Elisabeth Gaskell, already in the 19th century. I have also read several other biographies, so it was with some excitement that I opened the first page to read this biographical fiction of them. It is a very brave task to take on to write a biographical fiction about such well known and loved characters. Lynne Reid Banks has managed beautifully. I must admit thought that it took me a little bit of time to get into it. However, that changed rapidly after the first part. The more I got into the book, the more I was overwhelmed of the way she is characterising the siblings, and other persons relevant to the Brontës. She makes them come alive. She seems extremely well read on the family history, and she has mingled their lives with their fiction and created each of the family members as, at least I, imagined them to be. We tend to look at them as an entity, but they are four rather different characters, and they are here beautifully and lovingly portrayed. The story of Branwell is always a sad story. I thought though that it was so well imagined, and written with such care, that his miserable character came alive on the pages. His inability to hold on to a job, his illness, his overestimation of his own talent, his decline into death by despair, drugs and alcohol. You cannot but feel sorry for him. Charlotte, the oldest sister who always took care of the others, who seemed mostly unhappy, but had her happy moments as well. Her love for M. Heger is delicately balanced, and her longing once she is back in England, so well written that I think the reader feels what she felt. Emily, the tough but still vulnerable figure with a lot of wild passion inside her. She held it under tight reins but she could let it show when she walked her beloved moors and in her masterpiece Wuthering Heights. She could not bear to be away from Haworth and suffered incredibly the three times she ventured out into the world. Anne, the youngest sister was very gentle. She seemed fragile, but was maybe the strongest of them all, in her religious beliefs and her stubbornness to finish what she had started. For several years she worked as a governess to help earn money for the family. Branwell got his job as a tutor to the son at Green Thorpe through her, but it ended in disastrous results when he fell in love with the wife. The description of the scenery and the people surrounding the siblings, is very well done, and makes it very real. Their lives are told from the angle of each one of them, which makes it even more fascinating. The same situations are interpreted from different sides and different persons. 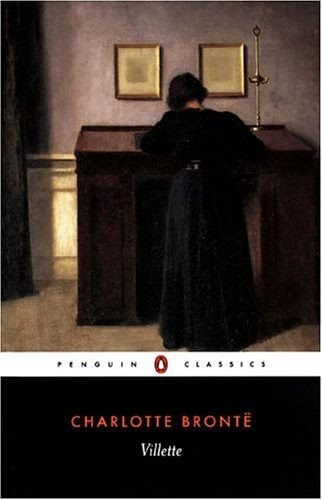 Jane Eyre, Wuthering Heights and The Tenant of Wildfell Hall, have been read by generations ever since they were written. Here you enter into passionate stories of strong characters, feelings and passions, and in the background are always the moors. The sense of desolation in their books seems to have come from their daily lives. I found that Lynne Reid Banks have managed to keep this special atmosphere in her telling of their story. The book brought me back to the times of the Brontës, and it was as exciting and passionate, as to read one of their books. It really took me some time to come back to the 21st century once I finished it. 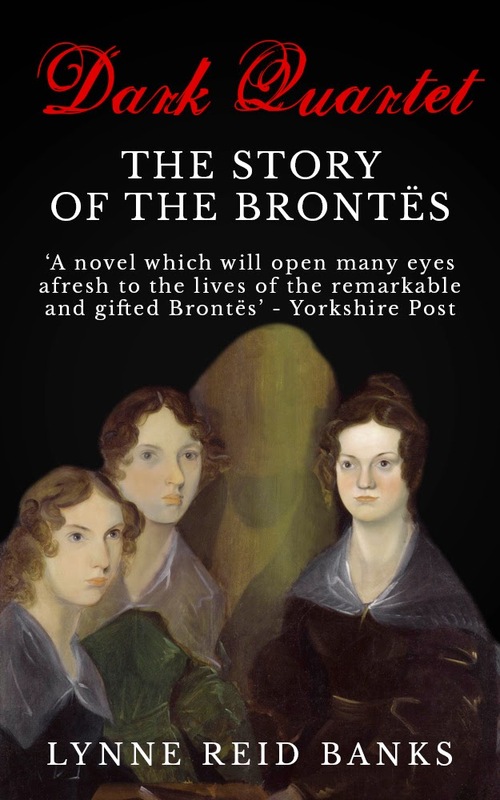 If you love the Brontës, and if you love biographical fiction, this is a book for you. This book was given to me for free from Endeavour Press. The views put forward are my own personal views. Constantin Meunier (1831-1905). The Belgian artist was among the very finest of 19th century sculptors; Rodin was a great admirer of his work, as was Vincent Van Gogh, who once declared Meunier to be "far superior to me". It was no simple coincidence that Meunier and Heger shared the same forename. There were in fact real connections between the two men. Constantin Heger was Constantin Emile Meunier's godfather, and the sculptor was given his first name in his honour. Meunier was baptized at Ste. Gertrude's, Etterbeek, on 13 April 1831. Constantin Heger and Marie-Josephe Noyer, who were to marry in September 1831, stood for him as godparents. Marie-Josephe Noyer and Meunier were second cousins, related through the Ghigny family, from Rebecq (Walloon Brabant). The church where Constantin Meunier was baptized no longer stands, demolished in 1993 when menacing cracks started to appear in its towers. However, the house in Etterbeek where he was born still exists, surviving somewhat uncomfortably between modern constructions on the Chaussée d'Etterbeek 172, opposite the Parc Léopold. There is a memorial plaque to the artist on the façade. When Constantin Meunier was aged around 11, Heger advised his godson to study at Brussels' Athénée Royal, where he himself was then teacher of the junior class (classe élémentaire). 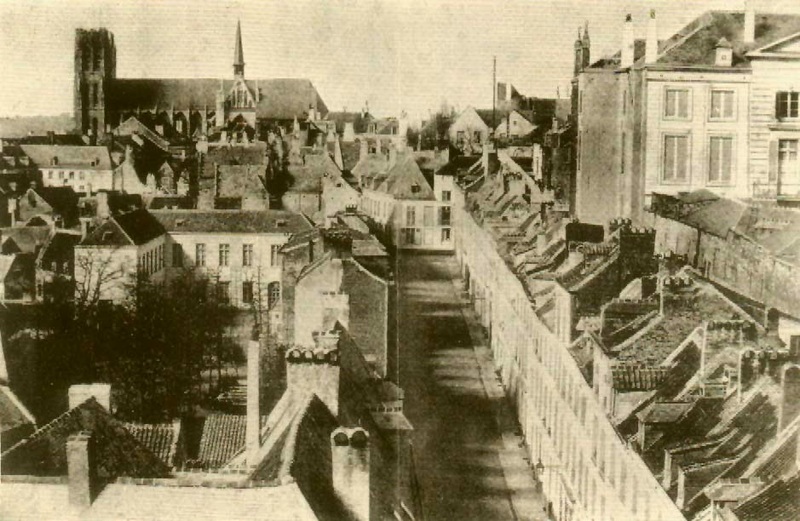 Meunier entered the Athénée in 1842, the year the Brontë sisters came to Brussels. However he struggled with his studies; by 1845, he had already left the Athénée. It is no wonder that Meunier did not get on well at school. He was a rather sensitive child; it is said of him that up to the age of 15, he used to cry every evening. If Charlotte and Emily Brontë were sometimes sad in Brussels, it was unlikely they were ever as sad as the young Meunier was! Meunier in later years was a regular guest at the pensionnat which Heger ran with his wife Zoë Parent on the Rue d' Isabelle. 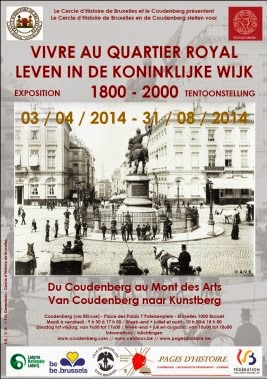 Indeed the Heger-Parent Pensionnat was a welcoming place for a number of notable Belgian artists over the years. Some were artists who also gave classes there, such as the painter and illustrator Paul Lauters (1806-1875) and the composer Etienne Soubre (1813-1871). Others were men with family connections to the Hegers, such as Edmond Picard (1836-1924), the controversial writer and lawyer, whose brother Emile was married to Victorine Heger, Constantin's daughter, and the engraver Auguste Danse (1829-1929), Meunier's brother-in-law. It is not surprising that artists were welcome at Rue d'Isabelle, 32. Constantin Heger was a member of the Brussels Cercle artistique et littéraire, and although he never wrote or painted himself, he had a keen interest in the artistic world of his day. His daughter Louise (1839-1933) was a talented singer and painter; she was a popular figure in the artistic world of 19th century Brussels. There are other links between the two Constantins which are worth highlighting. Both men at a young age witnessed tragedy and suffering in the family home. Constantin Meunier was four years old when his father Simon Louis Meunier died on 10 July 1835, at the age of 45. Serious financial problems seem to have precipitated his death. Heger too was still very young (aged 13) when he lost his father Joseph-Antoine Heger in 1822, also in circumstances of financial ruin. Further deaths occurred which affected both men profoundly. In 1833, not so long after marrying her, Heger lost his first wife, Marie-Josephe Noyer to (probably) consumption. 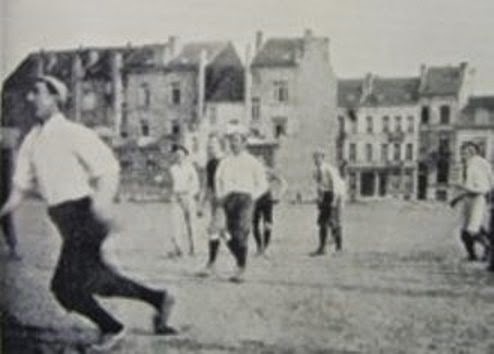 In 1894, Meunier lost his two dearly-loved sons in quick succession - Karl, who died of consumption in Leuven, and Georges, who died of yellow fever in Brazil. These various personal tragedies perhaps helped both men to empathise with the suffering of others. Both the professor and the artist showed a deep solidarity with those suffering from chronic poverty and harsh working conditions. 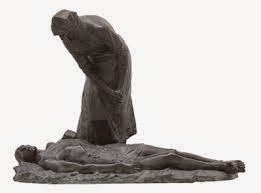 The theme of humanitarian concern is central to the work of Constantin Meunier, as in his sculptures dedicated to the cruel mining world of the Borinage (near Mons in Southern Belgium). His godfather Heger, for his part, dedicated much effort to teaching and aiding the poor workmen of 19th century Brussels. In Mrs. Gaskell's The Life of Charlotte Brontë (1857), Chapter XI, mention is made of his long hours of work with the Brussels underclass, as a devout member of the St. Vincent de Paul Society. Constantin Meunier's humanitarianism, however, perhaps owes less to orthodox religious beliefs than that of Constantin Heger. The name 'Constantin' comes from Latin, meaning firm, resolute. The idea that a man spends his whole life somehow fulfilling his forename seems true when applied to the professor and the sculptor. The two Constantins, Heger and Meunier, dedicated themselves from an early age to their respective passions of pedagogy and art. Over the course of their long lives, they stood firm, never renouncing the ideals which motivated them, above all the belief in the essential dignity of man. Despite many personal tragedies and set-backs, the two men strove tirelessly to combat human suffering and ignorance, and to bring about a more just, enlightened world. A. Behets, Constantin Meunier. L’homme, l’artiste et l’œuvre (Bruxelles: Office de publicité, 1942); A. Fontaine, Constantin Meunier ( Paris: Félix Alcan, 1923); M. Jerome-Schotsmans, Constantin Meunier : sa vie, son œuvre (Bruxelles: Belgian Art Research Institute, 2012); Anon., La vie de Paul Héger (n.p., n.d.), Belgian Royal Library, ref. :7B 3339. Two women watching each other formed one of many memorable scenes of a talk given to the Brussels Bronte Group last month. Only one woman knows she’s being watched, while the other quietly and tidily sifts through private belongings. The two women are Madame Beck, searching through the possessions of the enigmatic teacher Lucy Snowe, the other is Lucy herself, following the headmistress’s moves through not-quite closed eyelids. The talk was “Shoes of Silence and a Face of Stone: Surveillance and Secrets in Charlotte Bronte's 'Villette'. Students and members of the Brussels group met to hear award-wining historian and biographer Lucy Hughes-Hallett give the talk at the Université Saint-Louis. Group committee members Myriam, Lisbeth, Sharon and Marina brought local cakes and tarts for listeners to buy, along with the regular free tea, coffee, juice and biscuits. The audience was set to watch and learn on a sunny Saturday morning in October. 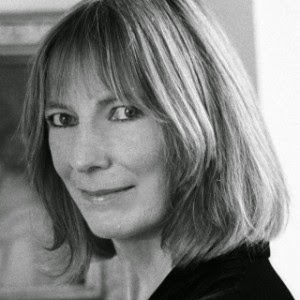 Lucy’s name, from the Latin for “light”, is also revealing in the context of what is shown and what held secret, said Hughes-Hallett, winner of the Samuel Johnson Prize and the Costa Biography Award. Other secrets and hidings central to Villette and discussed at the Brussels talk include the beloved letters covered with an almost ludicrous number of wrappings, and then buried. Errors made in the perception of others were also covered in the talk. These include the failure to recognise Polly when she grows up as Paulina, and the true identity of Dr John – another secret Lucy chooses to keep from the reader for much of the book. Fortunately for us, Lucy Hughes-Hallett’s presentation was more revealing than Lucy Snowe’s narrative. Members of the Brussels Bronte Group ended the hour far wiser than Madame Beck, after her 15 minutes considering the “sleeping” protagonist of Villette. 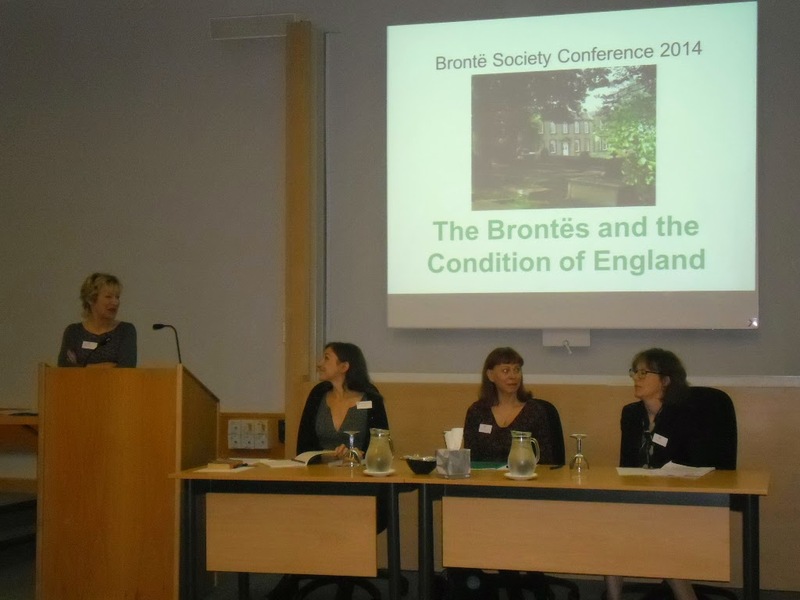 I’m happy to report that a Brontë Society American Chapter Blog is now available. Our primary purpose is to offer a visitor an opportunity to talk Brontë. The Brontë Society American Chapter blog home page invites visitors to comment on a selected Brontë topic. The current one is “How I met the Brontës”. Other pages include “Gallery” for photos and “Scribblemania” where Brontë inspired prose and poetry can be shared. 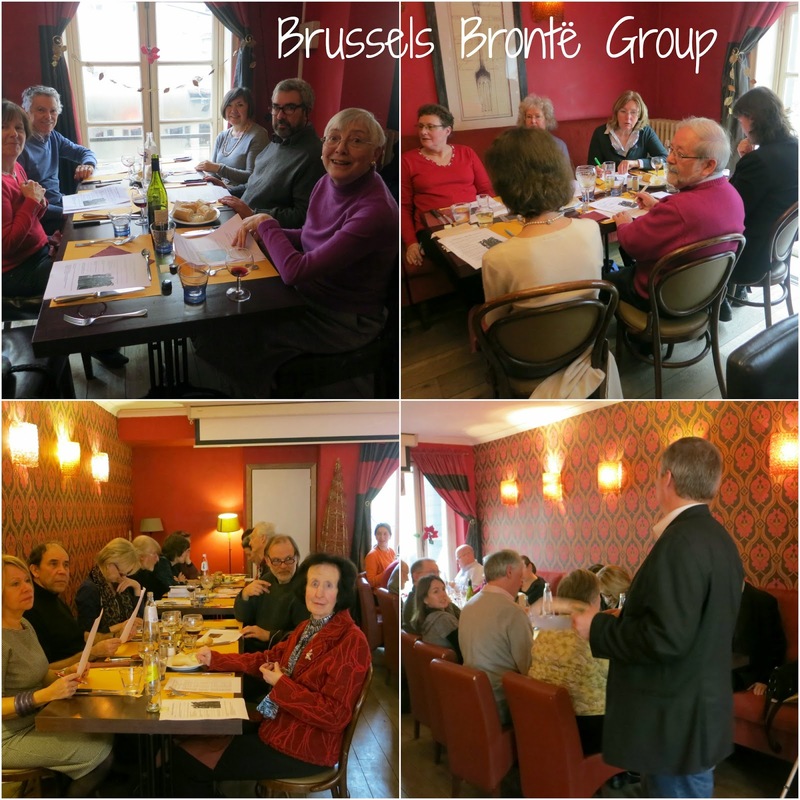 Brontë Brussels Group folks are invited to come visit us and share Brontë. Your blog address is posted on the Brontë Society American Chapter Blog “Links” page. You can find the link to the American Chapter Blog on the right hand side, under links. least when they were young and all at home in Haworth, reading as many magazines as they could lay their hands on and debating the articles read. families were very often in trade. This gave them a wide, though very Cornish, network of connections in all directions of life, including a scientist like Sir Humphrey Davy. There is still a lot more to be done here, but I think Mrs. Gaskell would have been astonished already. The first Session (on Saturday) was on Patrick Brontë. Dr. Logan, from the Irish branch of the Brontë Society, made clear to us how much Patrick was moulded by the people he met when he was young and still in Ireland. Not only his own kin, but people in a wider circle, who saw how promising a young man he was and helped him to Cambridge University. 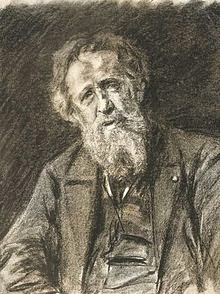 In Isobel Stirk's story we see Patrick later in life, preaching in the church in Haworth to rich and poor people alike. Patrick would talk to everybody: he wanted to help the poor and needed the rich people to get things done, like healthy drinking water for all the people of Haworth. Brian Wilkes gave us lovely insight in his rich knowledge of all things Brontë and in this case all things Patrick and the world beyond. 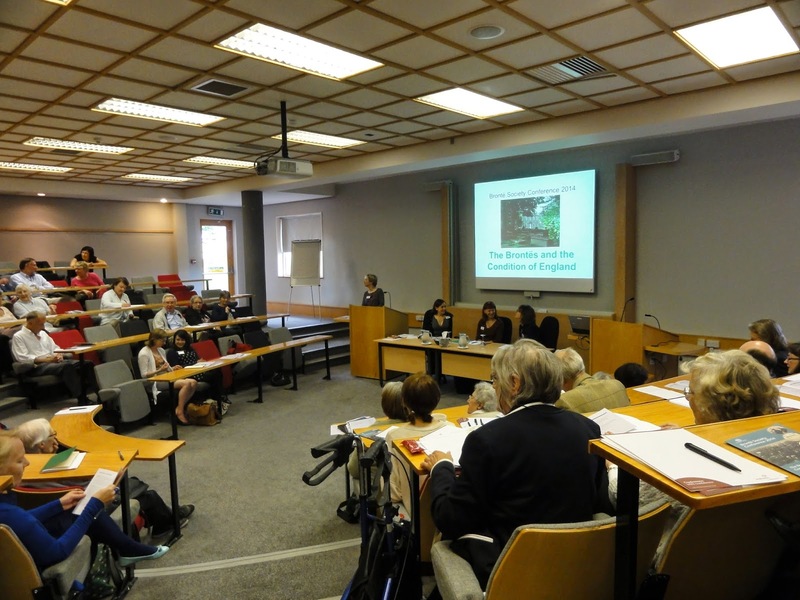 Marianne Thormählen discussed the case of the Brontë novels being historical fiction or just fiction. Of course Shirley is set in the time of the Luddite Riots, a time Patrick could clearly remember, but there are no historical figures in Shirley, nor in any other of the Brontë novels. to Durham before the dreadful cholera that killed him, struck Haworth, but he decided to stay and help Patrick with his huge parish. not become too Catholic, nor too Protestant and certainly not too far from the daily life of its people. Though Charlotte Brontë is not known for her progressive thoughts on religion these ideas, especially the third one, sound very modern to me. The third Session was on Industrial Unrest. Ariella Feldman told us, that even in very difficult times for workers, like in the beginning of the Industrial Revolution, workers, rebelling against losing their jobs, would still use a folklore kind of yell when attacking the mills, so maybe not all the fairies left, when industrialisation began. Erin Johnson talked us through the influence of the Captains of Industry in those days and of writers and historians like Thomas Carlyle. tightly laced as she was herself by then by her friend and colleague Marianne Thormählen, but still. One wonders how any woman could work with a corset on. Or walk on the moors. Or go on with your lecture like Birgitta. It changed her breathing and therefore her voice, like modern day high-heeled shoes change your walking. Molly Ryder, in her talk on ‘Asylum Metaphors in Villette’, kept to the theme of confinement and gave us an insight into what solitary confinement, not just in a corset, but in an asylum could do to a person, woman or man for that matter. the Condition of England. Sarah Fermi, great organiser of this conference, ended the series of lectures by thinking aloud on the question of colour. There is still a lot of research to do on questions like: did the Brontës meet coloured people? Did they know people who got rich by trading slaves? And what did they think about that? And of course the never answered question: where does Heathcliff come from? 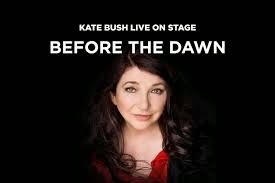 My impressions regarding the Kate Bush concert “Before the dawn”. 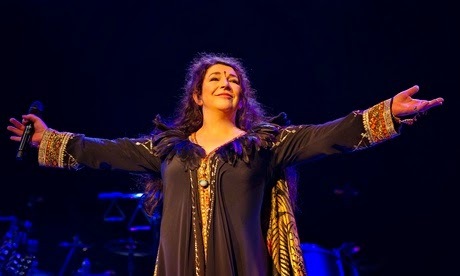 After 35 years of silence as far as concerts are concernd, Kate Bush was back on stage in the Hammersmith Apollo in London for 22 concerts between 26 August and 1 October 2014! theatre) as a starter before the concert, premium seats for the concert and the wonderful souvenir book were all included in the package. The atmosphere of anticipation beforehand, waiting outside with the crowd to get in the concert hall, was really magical. You could feel the excitement everywhere! I loved the first part of the concert, which was a series of songs followed by a theatrical performance of “The Ninth Wave”: Kate gave a spectacular show, she had a very strong voice and the whole story was fascinating to watch. The second part after the break was in my view a little bit less interesting, still spectacular in a way but also very confusing. Less strong than the Ninth Wave performance. The anticipation and expectations in the concert hall grew with the “encore”, and although she performed two beautiful songs, you could feel that the audience was waiting for “Wuthering Heights”, which did not come. The audience was applauding for more, but Kate did not return to oblige. That was a little bit of a disappointment, but overall I was glad to have been there and seen it all. It was certainly a magical evening. Something to treasure always. My missing link: A visit to Patrick Brontë’s homeland in Co. Down, Northern Ireland – tracing the Brontë family roots! 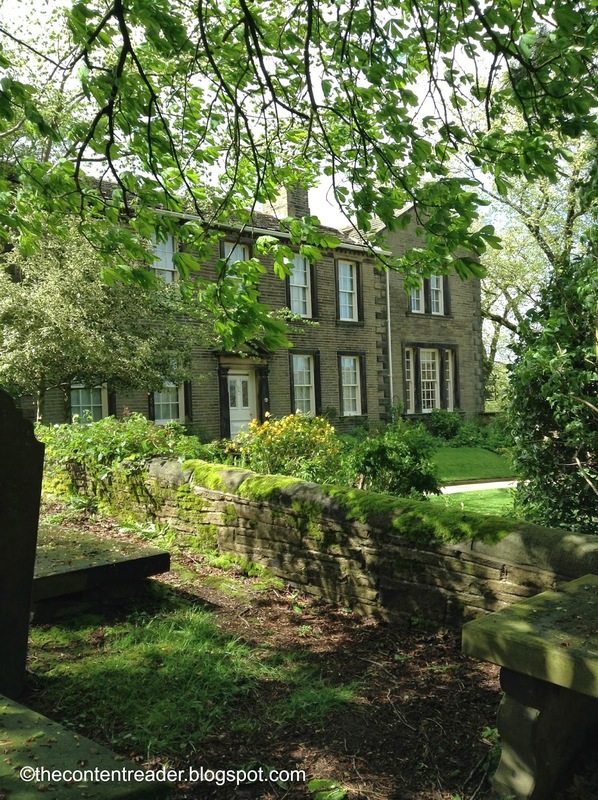 Over the years I have been able to visit many places related to the Brontës, both in the UK and in Ireland, but there was one place that I had not yet visited and which is essential to the Brontë history: the place where Rev. 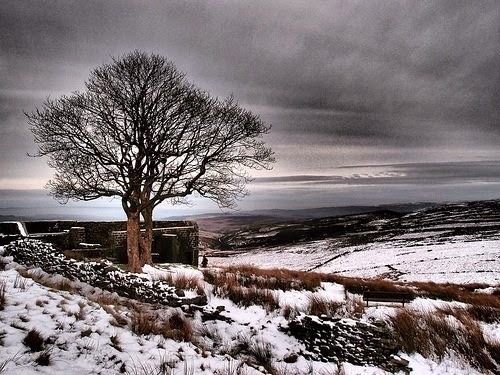 Patrick Brontë was born and where he grew up. This was my missing link in the Brontë story. So this year’s mission on our holidays in Ireland was to be a visit to the area where Patrick Brontë was born and lived until he moved to Cambridge, the area around Rathfriland in County Down, Northern Ireland. I have always been fascinated by the Brontës’ Irish ancestry (probably a consequence of my fascination with Ireland in general) and have read all that I could find on this topic. 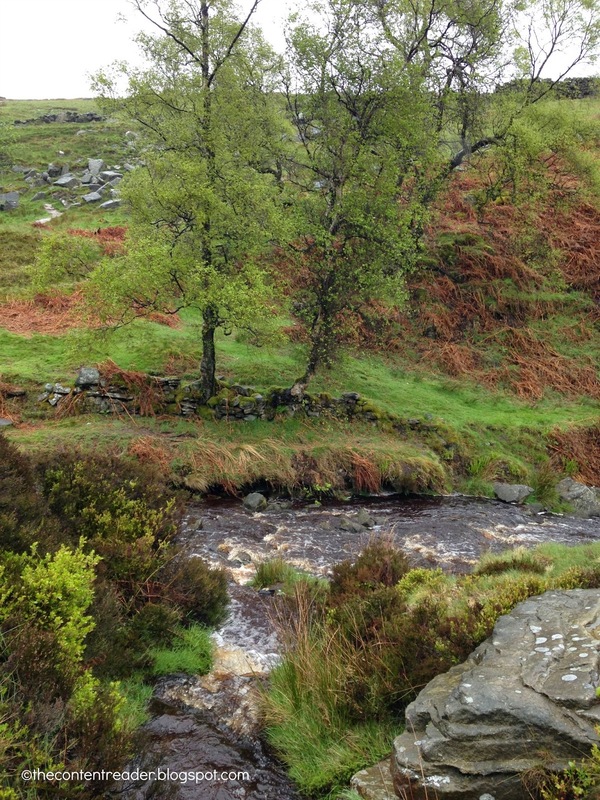 So you can imagine that I was very excited to see the area where Patrick Brontë spent his early years and to visit the places related to his family. The day of the visit was to be Saturday 26 July 2014. On our way back home from Boyle to Dun Laoghaire (Co. Dublin) a small detour was planned to Northern Ireland, where I booked us into a B&B in Rathfriland for one night. In preparation of this visit I had been (re)reading some books on the Brontës’ Irish background. My main guidebook for the trip was to be “The road to Haworth – the story of the Brontës’ Irish ancestry” by John Cannon. This book tells the story of the Irish Brontës, it gives a very good picture of their family history (as far as it is known) and it reads like a Brontë novel. It gave me some background information for the visit of the Irish homeland. We set off in the morning and planned to arrive in the Rathfriland area around noon. A few days before our departure I had phoned the secretary of the Irish section of the Brontë Society, Miss Margaret K Livingston, to see whether we could meet her when we were in the area. We decided to meet up at 1 pm for a picnic lunch at Drumballyroney where the Brontë Homeland interpretative Centre is situated. The Drumballyroney Schoolhouse and Church are also the start of the Brontë Homeland drive. The Rathfriland area breathes Brontë: a lot of houses or institutions have a Brontë-related name: Brontë manor, the Brontë primary school, a Brontë nursery unit, there was even a house called “Villette”. We arrived at 12 o’clock on the dot, the time that the interpretative centre opened its doors. No need to say that we were the first visitors of the day. Since we were well before the time set to meet Margaret, I had some time to browse around in the Schoolhouse to see the video on the Brontë family and read all the information panels, giving information on the various members of the Brontë family, including Patrick Brontë’s parents and their unusual “country courtship”. The small schoolroom also contained some exhibits related to Patrick Brontë and the Brontë sisters, amongst others a replica of Charlotte Brontë’s wedding dress. Margaret arrived well on time and was accompanied by another member of the Irish section, Mr Finny O’ Sullivan. The weather gods were not on our side that day, it was pouring outside. But a picnic was planned, and a picnic we would have! Margaret decided to have a picnic in the schoolroom: since we were the only visitors at that moment, this was not a problem. We were treated to a real picnic feast: lovely fresh sandwiches, biscuits, cake, strawberries and cream, tea & coffee and juice, … too much for our poor bellies! Monica Kendall tells of her search for her relatives in Brussels. I am the great-great-granddaughter of that Mrs Jenkins (her name was Eliza, née Jay), and of Rev. Evan Jenkins, the British Chaplain in Brussels from 1825 until his death in 1849. 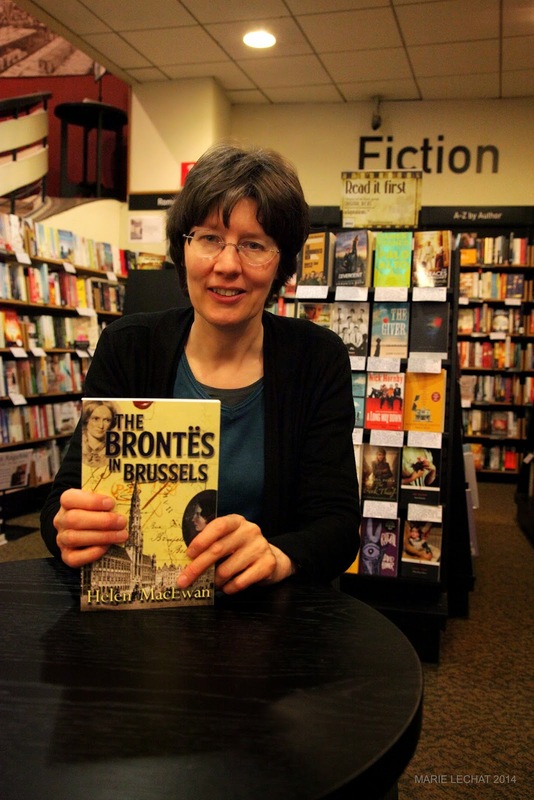 Until October 2013 I knew quite a bit about the Jenkins family in Brussels, though mostly in the second half of the nineteenth century, but knew nothing about our connection with the Brontës. It’s a mystery why there are no anecdotes in the family. But thanks to hugely helpful people who responded to my interest (and an inordinate number of emails I sent) I finally arrived in Brussels in February 2014 to investigate. It was the same month Charlotte and Emily arrived, 172 years before – rather more quickly (by Eurostar from London where I live) than the Brontës had managed! But first, grateful thanks to the following for their support, time, help and information: Brian Bracken, Mme Jacqueline Charade and all at the Chapel Royal, Roger Cox, Robyn Crosslé, the staff at the Evere cemetery, Jones Hayden for a wonderful walk around Brontë Brussels, Renate, cousin Suzie Walker, Marcia Watson and above all to Helen MacEwan, of the Brussels Brontë Group, who not only found more Jenkins graves than I could have possibly hoped for, and rubbed off moss with Renate before I visited, but recommended my (excellent) hotel, found time to answer all my emails, saved me from howlers and organized my Saturday which ended up with a descendant of the Hegers and descendant of the Jenkinses downing (in my case) copious amounts of wine in a wonderfully convivial way which I will always treasure. Heger) and Monica Kendall (great-great-granddaughter of Rev. What follows is my journey and discoveries in Brussels over three days. In 2000 I wrote an article for my grandfather’s school magazine, entitled ‘My Grandfather Jack’. My grandfather, John Card Jenkins (1874–1958), founded a school in New York in 1904 called St Bernard’s. It is an extraordinary and unique prep school for boys and I have visited it twice – as recently as autumn 2011. My article was accurate: but with one big error about the Jenkins church in Brussels (see below)! My research for it was based on his elder sisters’ scrapbooks that went to my mother Dorice on their deaths (my last great-aunt died in 1954). They were the daughters of Rev. John Card Jenkins (1834–94) who had been an Anglican chaplain in Brussels, after his father and elder brother. 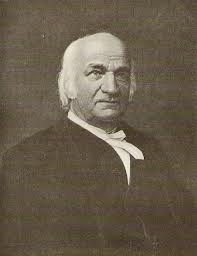 I found then that the roots of the school in New York lay in Brussels in the 1820s, with Rev. Evan and Mrs Jenkins. My mother, Dorice Kendall, née Jenkins, remembered stories of Brussels from her parents (both British, who were born or grew up there), and in my article I tried to describe Brussels of the nineteenth century. I mentioned the Brontës in passing: ‘In this city ... Emily and Charlotte Brontë came to study languages in the early 1840s, and Charlotte returned to teach and found unrequited love.’ That’s all! Alas no one emailed me to say: But haven’t you read Mrs Gaskell’s biography? I hadn’t, nor it seems had any member of the Jenkins family, and I hadn’t even read Villette! What happened next, 13 years later, was one of those strange coincidences that change everything: I am an academic book editor, and I just happened in autumn 2013 to be copy-editing a book that included a chapter on Charlotte Brontë’s extraordinary novel Villette (a fictional name for Brussels). I decided to buy the book since my ancestors were in Brussels at the same time Charlotte had been there. Then out of the blue my cousin Suzie Walker (née Jenkins) asked for the number of the Jenkins home in Rue St Bernard in Brussels as her artist daughter was about to visit (I am the historian of the family!). 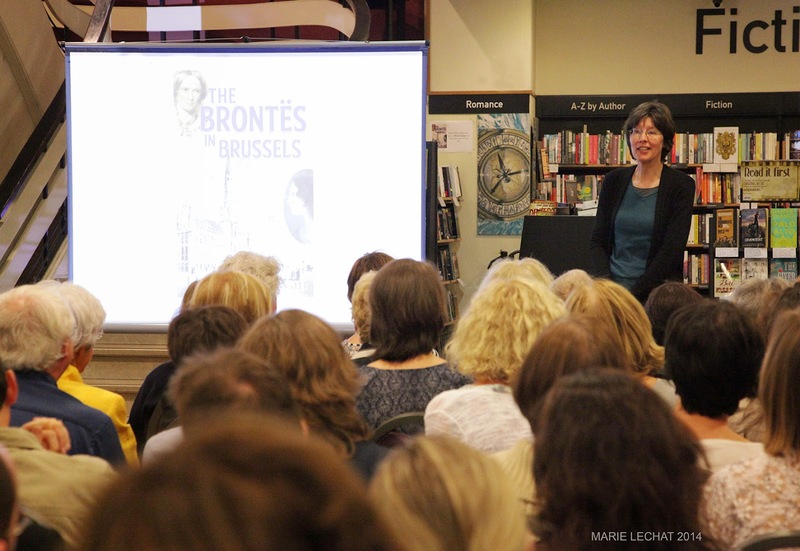 Suddenly Suzie emailed telling me to try googling this combination: Brussels, Brontë, Jenkins. I did so, intrigued. Suzie tells me she had just idly tried doing that combination as she explored her Jenkins roots and had found something amazing. And I came across Brian Bracken’s blog on the Brussels Brontë Group website about finding the whereabouts of the Jenkins home in Chaussée d’Ixelles: the house that Charlotte and Emily had ‘visited’ on several occasions in 1842–43. I was astounded. 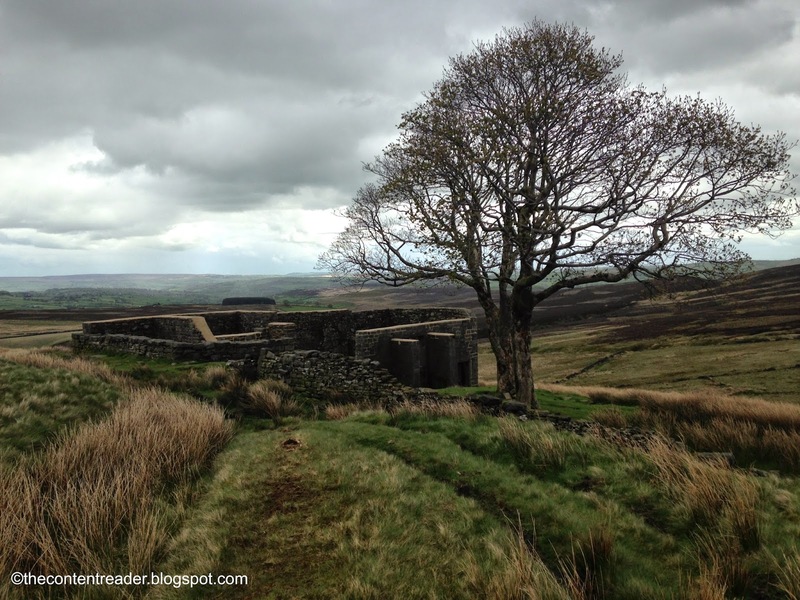 The Brontë sisters knew my ancestors? My research took off. I began to email total strangers, including Helen via the Group website, and Roger Cox, who had written a booklet on the Anglicans in Brussels, and then read as much as I could after work. And wonderfully most people responded! After a few weeks I knew I had to go to Brussels. Helen suggested a good time would be in February 2014 for Eric Ruijssenaars’ talk for the Group on the Isabelle Quarter where the Brontë sisters had stayed and learned. I booked my Eurostar ticket. So what did I find? On 15 February, for our first event of the year we were pleased to welcome Eric Ruijssenaars, who gave us a fascinating slide show of pictures relating to the research he did for his two books, Charlotte Brontë’s Promised Land: The Pensionnat Heger and other Brontë places in Brussels (2000) and The Pensionnat Revisited; More light shed on the Brussels of the Brontës (2003). Eric guided us on a virtual walk of the area round the Pensionnat. Many of those present have already been on one of our actual guided walks and this presentation provided an opportunity to gain a fuller picture of the area and its history. 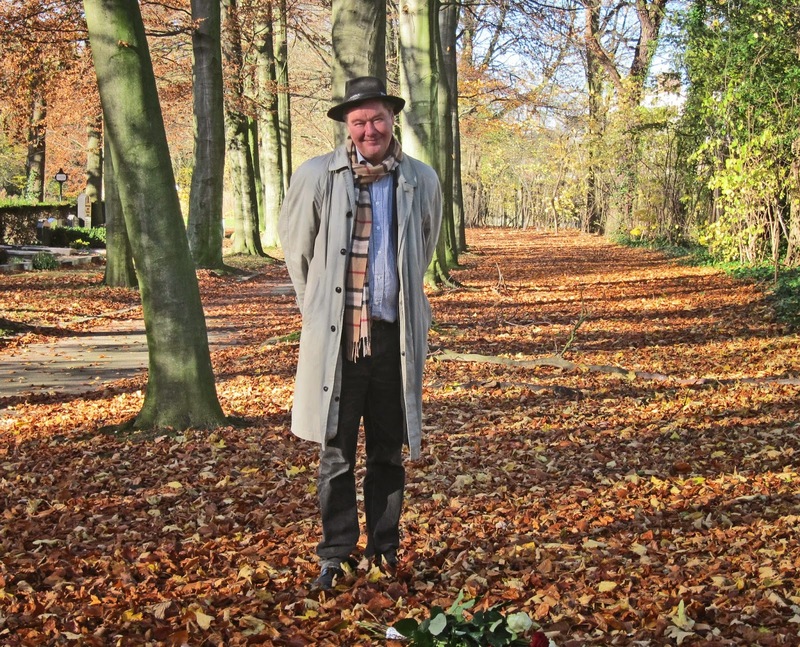 Eric, who lives in Leiden and has been researching the subject for the last twenty-five years, is always delighted to return to Brussels and his old Brontë haunts here. It is 25 years ago that I started doing research on the Brussels of the Brontës, aiming to recreate the Isabella quarter for her, the lady who had introduced me to Villette. Over the next decades I looked at every book and picture I could get hold of, in archives and libraries, to try to understand what the old quarter had looked like in the days of the Brontës. In 1990 I visited Brussels and the quarter for the first time, with Elle. I remember the excitement of standing on the Belliard Steps, though obviously having no real idea of the world ‘down these Steps’, and what it would all bring. Most recently, my talk for the BBG. Of invaluable importance was and is the iconic Tahon photo of the quarter, supposedly dating from 1909. For many years it hung on the wall at my desk. The crucial breakthrough came in 2003, when I took the picture to a photography professor of Leiden University. She said it must be an 1850s photograph. It’s possibly the highlight of these 25 years. Finally we fully understood the quarter. By implication it shows us the quarter as it was in 1843. With all we had gathered then, it had become possible to do a sort of virtual walk through the old quarter, in the mind. Just as I can easily imagine walking in, for instance the quarter as it is now. I hope that those who joined my walk can agree. 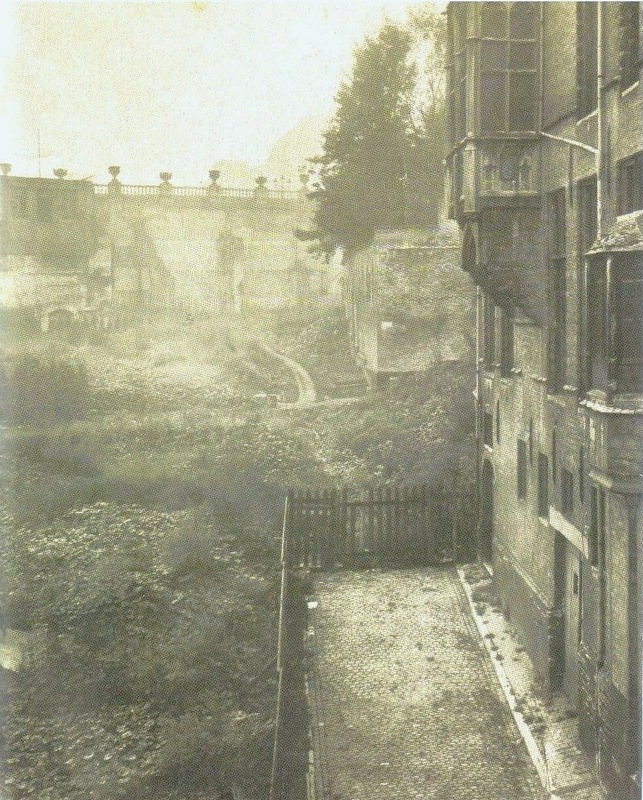 It’s a picture of the area where the Terarckenstraat now ends (with Hotel Ravenstein on the right). This time though we only need to climb over the gate to continue our walk, ‘through the mist of time’ (unfortunately I forgot to say that at my talk). At the same time it’s also a sad reminder of the very charming quarter that not long before had been demolished.